The Easter holidays are over and that makes me sad as we had such a wonderful couple of weeks. My motto for the holiday was "A change is as good as a rest" although when my husband questioned whether this was actually true I did suggest perhaps "A change is as good as we're going to get" would be more realistic. I do think the change of routine did us all good though and the lovely sunshine definitely lifted my mood. 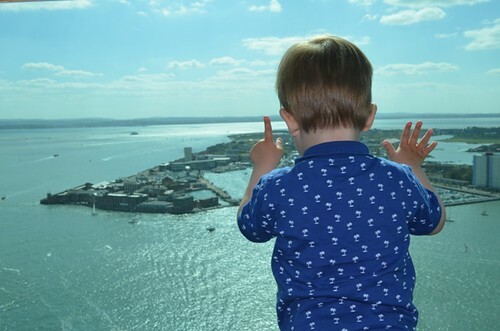 Here is a photograph I took of my little boy at the top of the Spinnaker tower in Portsmouth. He loved it up there and it's safe to say he's not scared of heights as he ran straight on to the glass floor and enjoyed looking down at everything below. Here's a list of a few other things we got up to in the past few weeks. Met up with friends - it was good for my daughter to catch up with various friends she doesn't see so much now they are all at different schools. I'm sure there other things I could mention but that'll do for now. I hope you've been having a fantastic time recently too. It was fab. Roll on the summer holidays now.